Roast Leg of Lamb, Brittany Style, Thyme for Cooking main course. I love beans or lentils with lamb. These are simmered with sage and rosemary, then stirred into the pan juices from the roasted lamb. I used a partially boned saddle of lamb that weighed 28oz (850gr), for a bone-in leg you'd want about closer to the 3 lbs (1.5kilo) To roast it properly, a meat thermometer is invaluable. Peel and cut garlic into slivers, 10 - 12 in all. Make slits all over the lamb with the point of a sharp knife. Insert a sliver of garlic into each slit. Place the lamb in a roasting pan just large enough to hold it easily. Roast in 450F (230C) oven for 20 minutes. Reduce the oven temperature to 400F (200C) and roast for another 15 minutes per pound, or until done to your liking. If the pan juices start to burn add a couple of tbs of hot water. Use a meat thermometer, if you have one and roast to 130F (54C) for rosy, or cut and peak. When done, remove the lamb, cover loosely with foil and let rest. Add beans and stock to pan, scraping and stirring with a spatula to get all the browned bits. Heat oil in medium skillet. Add leeks, celery, carrot and garlic and sauté until tender, about 10 minutes. Drain tomatoes, reserving juice for another use. Roughly chop tomatoes and add to beans. Cover reduce heat and simmer, stirring occasionally, 15 minutes or until carrots are tender. Spoon beans onto a platter. 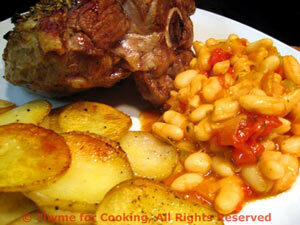 Slice some of the lamb, arrange on beans and serve.